Nursing homes, also called skilled nursing facilities or convalescent homes, serve anyone who requires preventive, therapeutic and/or rehabilitative nursing care. Nursing homes provide residential care for people who don’t require hospitalization but need 24-hour care they can’t get at home. Some nursing homes are set up like a hospital with staff members providing medical care. Nursing homes also provide a wide range of other services. Some residents also receive help with activities of daily living or participate in physical, speech and/or occupational therapy. Most nursing homes provide two distinct levels of care: one for short-term residents and the other for long-term care. Short-term nursing home care serves patients requiring care following surgery or an acute illness or injury. These residents stay on a temporary basis while they recover from an injury or convalesce following hospitalization. Once they’ve recuperated and met their doctor-ordered health and wellness goals, they transition back to their own homes. This group typically makes up a small percentage of most nursing home residents and may include people of all ages. Long-term residential care most often serves elders suffering from a chronic or terminal illness or cognitive disorder, such as Alzheimer’s. Long-term residents typically stay for the rest of their lives and require constant care and supervision. For these residents, the nursing home is more than a facility; it’s their home. Thus, some skilled nursing facilities are designed more like a home with a warm, reassuring environment and tranquil outdoor views and sitting areas to help put these residents more at ease. 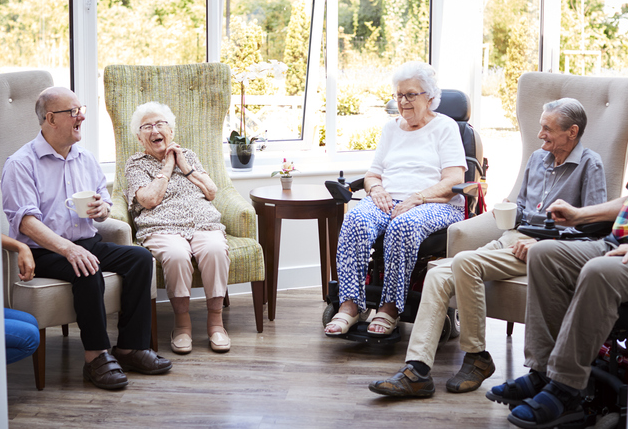 Moving into a skilled nursing facility for long-term care can be one of the most difficult decisions for you and your loved ones, but it can also provide many benefits. If you’re not sure your loved one needs to move into a nursing home to receive the care they need, consider some of these key signs it’s time to make that decision. 1. They require more medical attention throughout the day. Consider a skilled nursing facility if your loved one needs 24-hour medical care and the current living situation doesn’t provide it. 4. They’re not caring for themselves physically. 5. They can’t keep up with medication schedules. If your loved one often forgets whether they’ve taken their medications or you notice the medication counts aren’t what you would expect, these are signs that doses are being missed or repeated. Other signs they’re skipping medications include the return of symptoms or unexpected health test results. 6. They need frequent specialist care. One benefit of skilled nursing facilities is the easy access to specialists, such as wound-care specialists, social workers and physical therapists. Family members might find it difficult to take them to see these specialists regularly. 7. They suffer frequent falls. When you notice unusual and frequent bruises, fractures, sores or broken bones, it might be time to make the move. 8. They experience significant changes in wellness, routines and behavior. If you’re still not sure it’s time to consider a nursing home, it’s a good idea to go through a typical day with your loved one and observe how well they’re managing. You can also ask others if they’ve noticed any type of decline or significant changes you should know about. If they currently reside in an assisted living community, you can ask the staff, neighbors or other residents, or the staff might bring up their concerns to you and your loved one. If your loved one still lives at home, talk to people they interact with on a daily or at least regular basis, such as the mailman, neighbors, newspaper delivery person or anyone who might have noticed a change. Ease the transition into a nursing home by talking with your loved one about skilled nursing options sooner rather than later and always seek their input, especially when it’s time to choose a facility. Once your loved one moves into a facility, stay involved and in touch through regular visits or phone calls when you can’t visit. Get to know the staff who cares for your loved one and work with the ombudsman should any concerns arise about your loved one’s care. While nursing homes may be called skilled nursing facilities or convalescent homes, the level of care and services may differ. Intermediate care facilities are an entirely different type of facility and usually have much fewer beds than other residential care facilities, but they also offer fewer services. Services and amenities at skilled nursing facilities focus on medical care with 24-hour medical supervision and help with activities of daily living, such as bathing, dressing, using the bathroom and getting in and out bed. Your loved one may need to be in a skilled nursing facility if they are on a respirator, require regular physical or occupational therapy, are recovering from surgery or have wounds that require ongoing medical care. Skilled nursing facilities provide 24-hour staffing by licensed or registered nurses, with other staff members typically including social services and rehabilitation teams. Nursing homes differ from assisted living facilities and home health care, so ensure you’re choosing the right care option for your loved one by comparing the services provided in each situation. 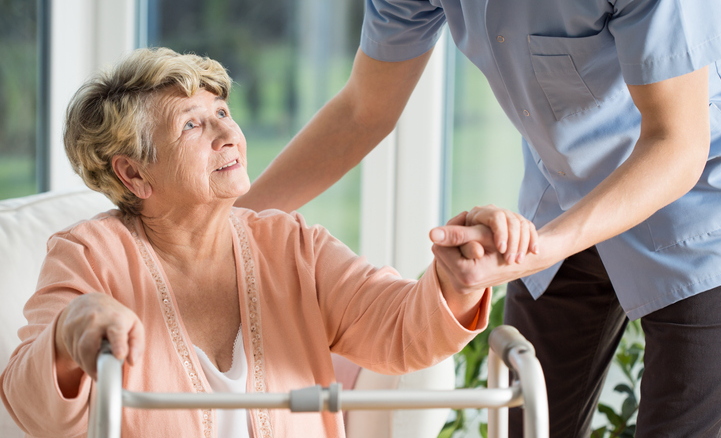 If your loved one doesn’t require full-time medical care or supervision but can’t continue living independently at home, consider assisted living in lieu of a nursing home. Assisted living facilities provide companionship and structure. Most residents still enjoy a high level of independence and privacy, which isn’t possible in a nursing home, and assisted living facilities also have the added benefit of receiving assistance as needed. Assisted living facilities, also known as residential care facilities, provide custodial care for seniors who need only limited daily living assistance, such as with housekeeping and meal preparation, and little medical care, such as help with medications. Nursing homes provide high levels of medical services and care, which these facilities don’t. If your loved one has a physical or mental health condition that requires full-time care, requires a wheelchair for mobility or has issues cognitive issues that cause them to become confused or wander, assisted living isn’t for them. Living arrangements are quite different at assisted living facilities. Most of these communities provide residents with a private or semi-private apartment with a bedroom and their own kitchen and bathroom. Most assisted living facilities also offer more freedoms, such as tobacco use, alcohol consumption, pet ownership and overnight guests. Because residents require less medical care and supervision, assisted living facilities are usually cheaper than nursing homes, but most don’t accept Medicare or Medicaid. Home health care is an option for seniors who can still mostly care for themselves. Home health care is ideal for anyone who wishes to maintain independence longer and often allows your loved one to age in place. There’s a difference between home care, which is non-medical assistance, and home health care, which includes medical and non-medical assistance. Both take place in the client’s own home based on their needs and schedule and are ideal for anyone who prefers to remain in their own home. 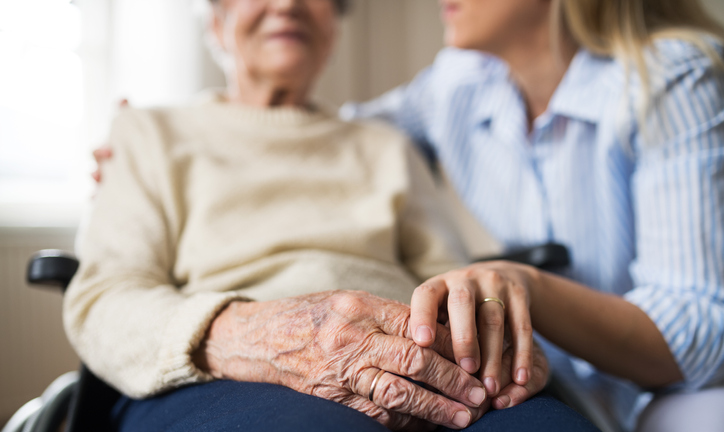 However, don’t confuse them with hospice, which also takes place in the home but is considered end-of-life care with medical treatment provided to clients who are expected to live about six months or less. Non-medical in-home care includes custodial care for seniors who only need help with activities of daily living. Home care workers, also called caregivers, are professionally trained to help clients maintain a safe environment and provide companionship. However, they don’t provide medical care. Home care is cheaper than home health care, which offers the same services plus medical care. The level of care required for home health care requires the experience of a registered nurse, which makes it much higher in cost when compared to non-medical home care and higher than nursing homes. Home health agencies provide skilled medical care workers who work in your loved one’s home. Home healthcare is ideal when your loved one doesn’t require hospitalization and doesn’t want to move to a nursing home or assisted living facility but also aren’t well enough to live alone yet. Home healthcare nurses provide the short-term medical care your loved one needs to recover from a surgery, serious illness or acute injury. These agencies are licensed by the state and must follow all federal regulations. Many older adults and caregivers worry about the cost of medical care. These expenses can use up a significant part of a family’s monthly income, even those who thought they had saved enough. How your loved one pays for their long-term care in a nursing home depends on their financial situation and the types of services they require. They may rely on a variety of payment sources, including personal funds or one of the following government-funded or private financing options outlined in the table below. If you’re counting on Medicare or Medicaid to pay for your loved one’s nursing home, find out whether a facility is government certified. Coverage under these programs is limited with strict qualifications, but you can learn more by contacting your local Social Security Office. At $3,000 to $10,000 a month on average, nursing homes are expensive, there’s no doubt about that. 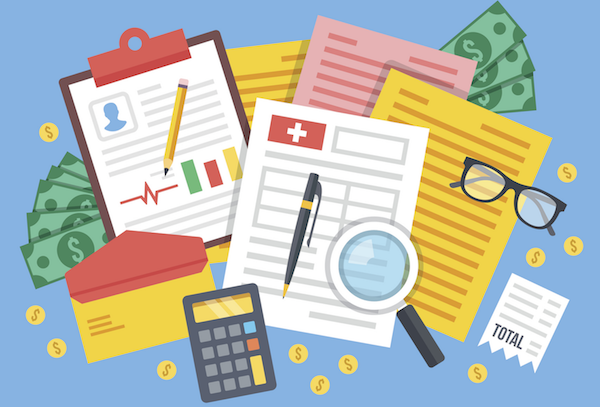 Payment details are complex, so be sure to check out this guide on paying for nursing home care. To start your search, type your zip code here in the Nursing Home Directory to find nursing homes in your area. Be sure to look for ratings and reviews from other family caregivers. You’ll also see the government’s star ratings for nursing home quality. Be sure to call numerous nursing homes to get a feel for the facility and what sets each one apart. There are numerous refreshing trends in nursing home care — including the emergence of smaller, homier nursing homes where care is provided in smaller, more personalized home-style settings. It’s always a good idea to ask for references and call them. To help guide your process, be sure to use our nursing home checklist.